eSupplyStore.com always provides shipping managers and small business owners alike the opportunity to find all of the shipping materials you need at extremely low everyday prices. From your basics like mailers, envelopes, packing materials and wrapping film to all of your warehouse supplies, you'll find it here for less, and getting more for less is always the best business practice. If keeping your products cool and fresh is a logistical imperative, our selection of cold bricks stacks up nicely. These foam bricks are stout enough to never leak, they're safe for food products and can keep your products cool for up to 12 days. 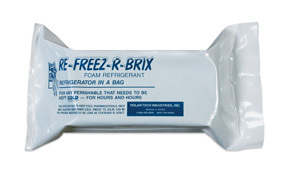 For longer shipping distances, these cold bricks pack tight and deliver cool efficiency. Select the size below to fit your packing requirements, and if you need any help with your order, our customer care team is always ready to help at 866-437-8775.